The role of the most significant battlefields and sieges in the story of the fight for Magna Carta are highlighted by The Battlefields Trust and The Magna Carta 800th Anniversary Commemoration Committee with support from the Heritage Lottery Fund. The Magna Carta 800th project will raise awareness of the battlefields and sieges associated with Magna Carta and the attendant Barons’ Wars. It provides interpretation and educational resources to tell this story, including the development of a battlefields trail integrated with the nationwide Magna Carta Trail. On this page, we will upload brief summaries of these battles, courtesy of The Battlefields Trust, one a day, throughout September & October 2014. Look for #MagnaCartaBattles to keep informed about the developments of this exciting project across the country. 1214: The Battle of Bouvines. The Battle of Bouvines, near Lille, took place on 27 July. King Philip II defeated the Holy Roman Emperor, Otto IV, conquering Flanders and the Angevin territories in France, and recovering lands once ruled by King John. No English forces were involved. John was Otto’s uncle, and the decisive defeat led to the English Barons gaining the confidence to confront the king and make him grant the Great Charter. For an article from the BBC about Bouvines, titled ‘the most important battle you’ve probably never heard of’, click here. 1215: The Siege of Northampton Castle. Northampton marked the beginning of the Barons’ Wars, but the rebels failed to capture the castle. It was the first of three sieges. King John was fond of the castle, and visited it over 30 times, but later gave it up along with three others in granting Magna Carta. In 1164, it was the site of the trial of Thomas à Becket. Early Parliaments were held there until 1331. Little now remains because of urban redevelopment, but the Friends of Northampton Castle have produced a film about the site and campaign for its protection. Norham Castle was a mighty English stronghold on a rocky outcrop on the south bank of the River Tweed. Now a ruin, it was built by Bishop Flambard of Durham in 1121, and being just half the river’s width away from the English and Scottish border, earned it the title of ‘the most dangerous place in England’. King John strengthened the castle from 1208 to 1212, and this helped it withstand a 40-day siege by Alexander II of Scotland, who had invaded northern England in support of the rebels in 1215. In 1215, Rochester Castle was garrisoned by rebel barons, and endured an epic siege by King John. Having undermined the outer wall, John used the fat of 40 pigs to fire a mine under the keep, bringing its southern corner crashing down. The defenders held on, until they were eventually starved out after resisting for two months. The soldiers were put to the sword. 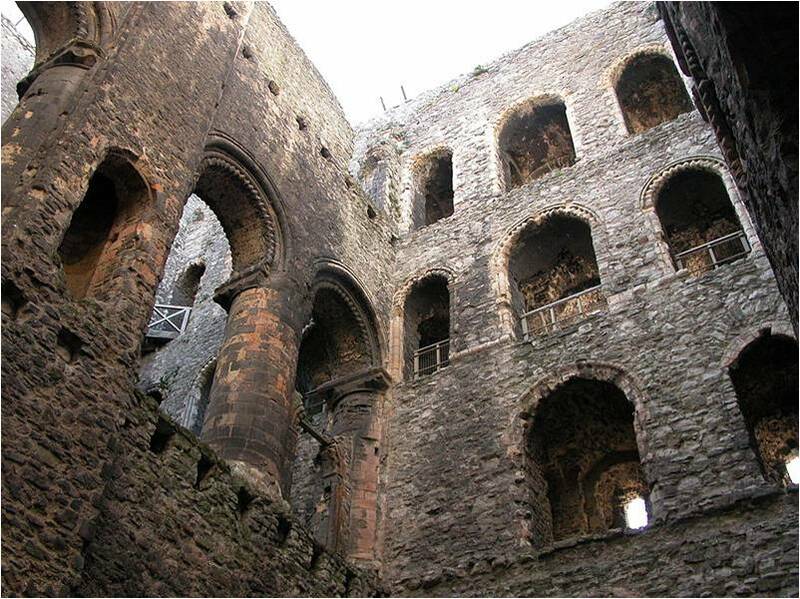 The high elegant towers of Rochester Castle stand as a testimony to its history of destruction and rebuild. The picture is the keep of Rochester, one of the most impressive in England. The dissent of the Barons now takes centre stage in what is now Exeter, far to the South-West of Rochester. Rougemont Castle is also known as Exeter Castle, and is a Norman structure, with some Roman origins. It was a Crown stronghold, but rebel barons captured it for a time. Much of the castle has now been restored for modern use. Tonbridge Castle was enlarged before 1100, with a squat tower. In 1215 Richard FitzGilbert’s grandson, Richard de Clare, attended the sealing of Magna Carta. King John then attacked and seized the castle, but it was returned two years later. A larger stone castle was rebuilt, including the massive gatehouse which still survives. In the relentless drive northwards by King John, many fortified sites were attacked. Ely castle was said to be ‘a strong fort of lime and stone’, within the precincts of Ely, but ‘that fort being often destroyed’ was rebuilt. The castle was said to have been finally taken and destroyed by Falk de Breauté, in 1216. Odiham had been a royal residence in the 12th century, but the present castle, built by King John from 1207 onwards, was built on a site to the North-West of the town. It was built for the King to enjoy hunting in Odiham’s Royal Deer Park. John visited on 4th June and then again on 9th June, meeting the Bishop of Winchester and proceeding to Windsor and Runnymede the following day. Following the sealing of Magna Carta King John stopped the night of 26th June at Odiham on his way to Winchester. Odiham Castle put up stout resistance to a French siege the following year, which inflicted so much damage as to need rebuilding, with the octagonal keep. These efforts supported the defence of Windsor Castle and help to ensure the French siege was repulsed there as well. After granting Magna Carta at Runnymede, the king retired to Windsor from the capital, which was soon afterwards occupied by the barons. Hostilities, however, soon broke out again; the barons abjured their allegiance and sought help from France. The invasion of England by Louis of France, which began in May 1216, was followed by the siege of Windsor Castle. The castle was held for the king by Fawkes de Breauté, one of John’s unsavoury advisors, who had filled the castle with foreign mercenaries. The siege lasted from June to September, when it was raised, and on the death of the king in October it was still in the hands of his adherents. In the northern reaches, King John arrived in 1216 to storm the fortified town of Berwick. On the river Tweed, it stood close to the borders of England and Scotland. The castle was founded in the 12th century by the Scottish King David I. Berwick is now a ruined castle in Northumberland owned by English Heritage. The 1216 siege of Barnard Castle in Durham was successfully resisted for King John by Hugh de Baliol against invading Scots. Leading rebel and Magna Carta surety Eustace de Vesci was shot dead by a crossbowman during the siege. The influence of the family enabled John Baliol, with the help of Edward I, to be crowned King of Scotland. In December 1216, Berkhamsted Castle was besieged by Prince Louis of France. It is likely that the constable at the castle was aware of the approach of a hostile force of French mercenaries. He will have hastily arranged for plentiful food supplies to be brought in: bread, cheese, eggs and meat. Hopefully, he would have sent women and children out of harm’s way, if only to preserve the food and drink supplies for fighting men. Wells in the bailey and on the motte provided plentiful water and they would have hunkered down, ready for the attack. After twenty days of siege, the garrison within surrendered. Next year, the year following the death of King John, the castle was reclaimed by Royalists. Another epic and desperate siege of the castle by Prince Louis of France, and said to be the most momentous in all English history. The French king supported the unruly barons by sending his son and large forces. All aspects of siege warfare were employed and ultimately failed. Siege engines, mining and even bribery did not succeed, though the French did capture the barbican and undermined the gatehouse. The defenders rebuilt barricades and beat back the French. One of the largest castles in England, it is still in good order under the custodianship of English Heritage. King John called upon the naval resources of the Cinque Ports (Hastings, Rye, Hythe, Romney and Sandwich) which provided 50 ships, and had another 50 built. (In 1213, Philip II had gathered a fleet to invade England with papal blessing against the excommunicated John. The allies surprised the French fleet at anchor, capturing 300 vessels, and burning 100 more!) The royalist naval victory of 1217 meant that the war was finally over. A month later, the Treaty of Lambeth ensured that Prince Louis and his men left England, never to return. Lincoln town was pro-rebel, but the castle held by Lady Nichola de la Haye was a pro-John castellaine. In May 1217, French forces besieging the castle were routed by a relieving force under William Marshal (Earl of Pembroke). The town was thoroughly sacked and its goods carried off by the victors earning the nickname ‘Lincoln Fair’. Henry III besieged the Bedford Castle in 1224 after a falling out with Falkes de Breauté. It involved an army of 2,700 soldiers. The siege of the mighty castle lasted from 20 June until 15 August and was one of the longest sieges of the century, rivalled only by those of Dover (July 1216 – May 1217) and Kenilworth (May to December 1266). It began with a move led by Hubert de Burgh to bring back under royal control all royal castles entrusted to the adherents of King John. It was the last outburst of violence which had begun at the end of King John’s reign but the firm action taken by the sixteen year old Henry III to capture the castle ensured that with the exception of the revolt of Richard Marshal in 1233, England was not riven by civil war for another forty years. It was another milestone in the flowering of a growing sense of Englishness. 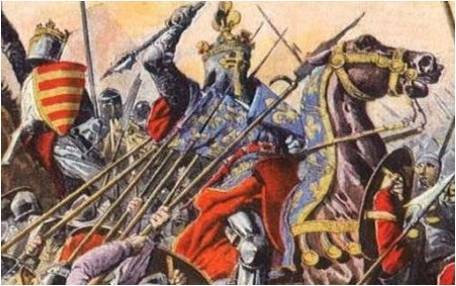 The first Battle of Northampton was fought between Lord Edward (the future King Edward I) and Simon de Montfort’s supporters. De Montfort’s supporters were besieged in Northampton Castle which fell on 6 April 1264. Some students who had run away from Cambridge had established the beginnings of a university at Northampton in 1261. The students supported De Montfort, but Edward won. Northampton, having openly supported de Montfort in the conflict, was punished. King Henry III disbanded the nascent university, on the basis that it might usurp Oxford and Cambridge. During the Second Barons’ War (1264–1267), Rochester Castle was besieged for the third time in its history. Roger de Leybourne, the royal constable, held Rochester in support of Henry III. Rebel armies led by Simon de Montfort and Gilbert de Clare entered the city and set about trying to capture the castle. Although unsuccessful the attack drew the royalist forces south where they were defeated at Lewes. The Battle of Lewes was the first of two main battles of the Second Barons’ War, which took place on 14 May 1264. It marked the high point of the career of Simon de Montfort, 6th Earl of Leicester, and made him ‘uncrowned King of England’. Henry III left the safety of Lewes Castle to engage the Barons in battle and was only initially successful. His son Prince Edward led a successful cavalry charge and scattered the London foot militia; but his knights proved impossible to rally to return to the fray. This allowed the Montfortians to overwhelm the rest of the royalist army and capture the king. Faced with a threat from abroad led by Henry III’s queen, Simon de Montfort declared that an army be drawn from every town, city and village to be assembled as a muster on Barham Down, near Canterbury ‘against the foreigners’. This large force was not to be tested in action as contrary winds kept the invasion force at bay. Pevensey Castle was of key strategic importance and a formidable fortress on the south coast of England. Simon de Montfort scored his notable victory at the Battle of Lewes, after which the defeated royalist army fled to Pevensey. They were pursued by de Montfort’s forces, but the garrison refused an invitation to surrender and had to endure a year of being besieged. The garrison was still able to raid the surrounding countryside undetected. They secured supplies of food despite the ditches that had been dug by de Montfort’s men, also obtaining food and weapons by sea in December 1264. The siege proved costly and ineffective, and was eventually lifted in July 1265. The Battle of Evesham in August 1265 was the second of two main battles of the Second Barons’ War. It was victory of Prince Edward, who led an 8,000 strong army of Henry III against 6,000 men of de Montfort, and the beginning of the end of the rebellion. It was a massacre as de Montfort’s army was trapped in a bend of the river and the earl was killed along with many of his supporters. Although Simon de Montfort died at Evesham, his ideals of reform did not. Those remaining loyal to de Montfort entered and occupied Kenilworth Castle. King John had lavished money on Kenilworth, turning it into one of his largest castles. John ceded the castle to the barons as part of the guarantee of the Magna Carta, before it reverted to royal control in the reign of his son, Henry III. The rebels had fled Evesham fearing for their lives. So began one of the longest sieges in English history. Between May and December 1266 the full might of the Crown was turned on the insurgents. The position of the reformers was hopeless and they capitulated. The Dictum de Kenilworth, a legal pronouncement intended to restore royal authority, allowed for rehabilitation, and some rebels reclaimed their lands for a fine. On 15th May 1266, a royal army, led by Henry of Almain, nephew of Henry III, defeated some of the remaining rebels who had been allied to Simon de Montfort. This was the Battle of Chesterfield. The fierce battle was one of the final conflicts of the 2nd Barons’ War and led to the capture of Rebert de Ferrers, Earl of Derby. Chronicles mention the use of covered wagons by the attackers and the fact that the Earl was suffering from gout at the time. Another reference is that during the fighting, the Men of Brampton retreated to that part of the churchyard wall which it was their duty to maintain in normal times, and they refused to give way. A battle was waged through the streets of the town of Chesterfield, largely after dark, lit only by burning buildings. Evesham was a decisive victory for the royal forces and Ely with its fortifications was also captured by Prince Edward. It had become a refuge for the resistance, though it crumbled as many nobles, including Earl Gilbert of Gloucester were re-admitted to royal favour. His siege tactics demonstrated his superiority over the renegades, and he benevolently offered them the peace terms of the Dictum de Kenilworth. Their inevitable acceptance of this settlement in July 1267 finally brought peace, two years after Evesham.